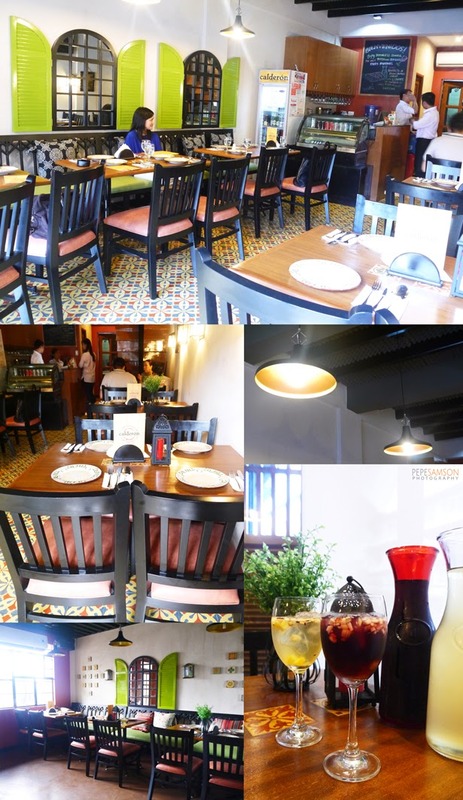 In the heart of Kapitolyo is a cozy neighborhood restaurant serving up Spanish specialties. 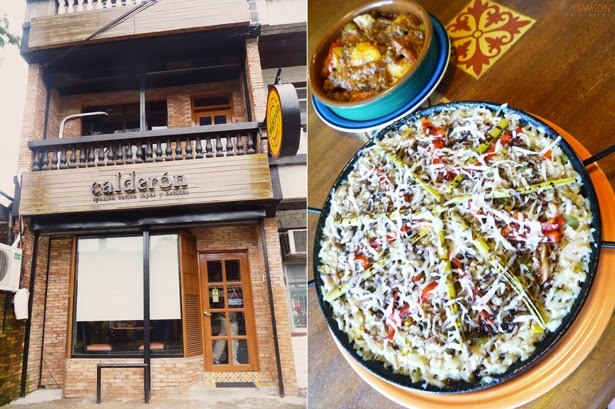 Calderon, veiled among the host of tea shops, burger joints, and breakfast places dotting the streets of Kapitolyo, is a secret waiting to be discovered. 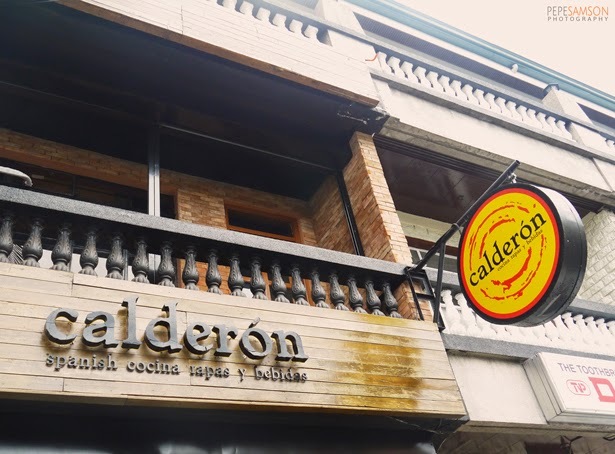 Owned by 3 people with a common love for Spanish cuisine, Calderon serves authentic Spanish food that are nostalgic and familiar -- something you grew up eating, something reminiscent of good times. The two-month-old restaurant (first branch in San Juan) is unassuming, situated beside a dental clinic and Banoi’s Vietnamese restaurant. It’s easy to pass by and not notice this small place, especially with the presence of “louder” alternatives, so I take it upon myself to shout out to the world—to my one or two faithful readers (LOL)—that Calderon is one of the best restaurants I’ve tried this year. Walking into the restaurant feels like entering somebody’s kitchen—it was like being ushered in as a guest for a home-cooked Sunday lunch. Simple chairs and tables litter the area, made bigger and brighter by the mirrors crafted like casement windows splashed with lime green. The second level provides more dining space as well an option for exclusive use. The menu is traditional Spanish: tapas, a selection of paella, mains, and some desserts, including the ubiquitous churros. 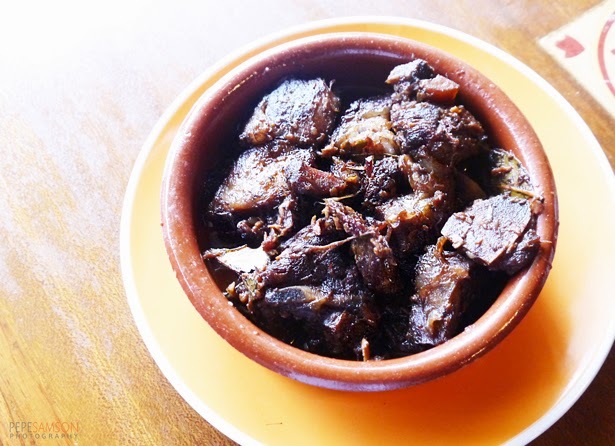 There’s the Callos (P320), a must-try in any Spanish restaurant. 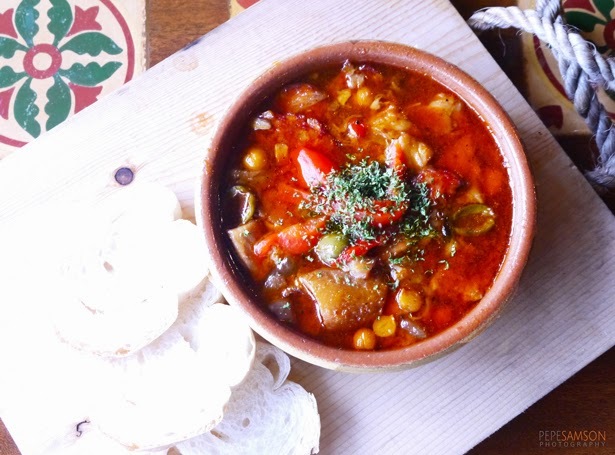 Calderon’s version is slow-cooked ox tripe, ox feet, chickpeas, and chorizo: a deliciously rich, thick stew perfect with the rustic bread—and for the rainy days. 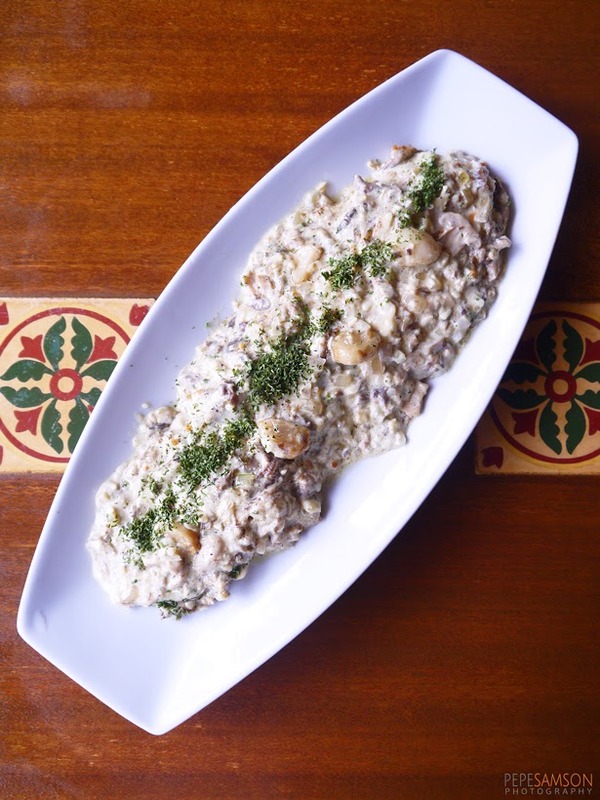 On the other hand, if you like creamy dishes, let the Lengua con Setas (P580) assail your senses: ox tongue slices so tender they almost glide inside the mouth, smothered in a velvety mushroom-butter sauce. I just found it to be bit too overpowering, or maybe I’m just not a fan of cream-based viands. 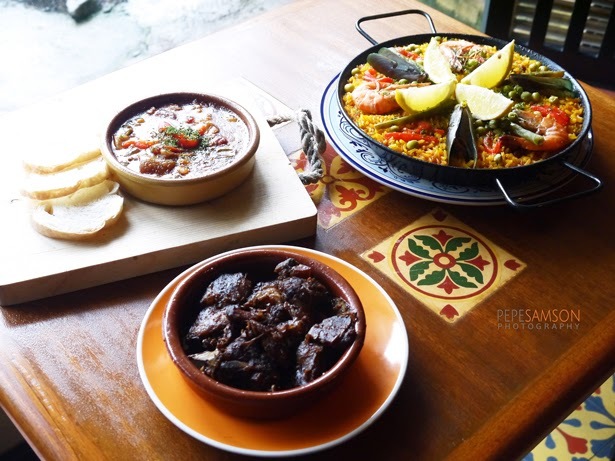 Going Spanish and not eating paella is foolish, and yes, we were lucky enough to try two variants. 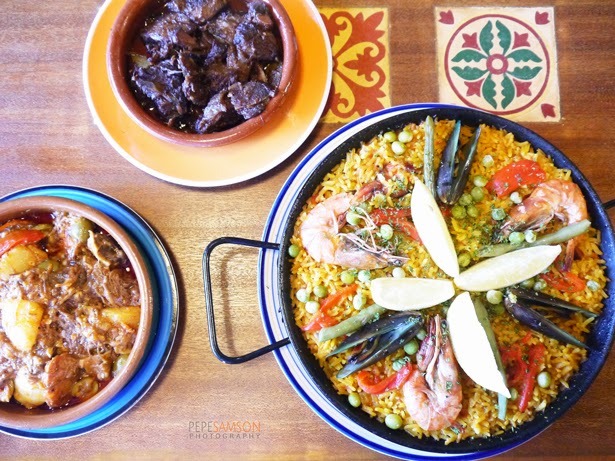 The Paella Valenciana (P780) is, deservingly, Calderon’s bestseller. 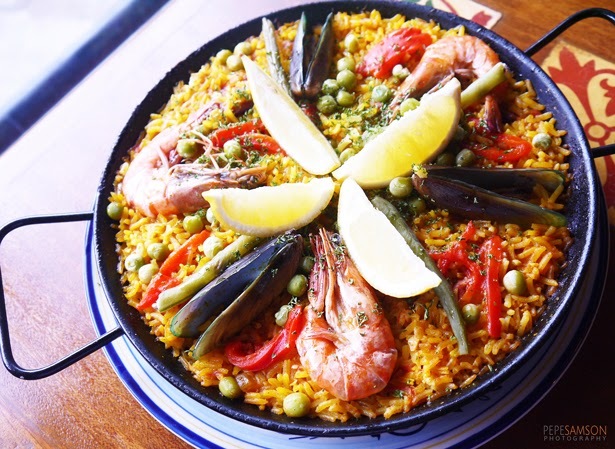 Prawns, mussels, chorizo and vegetables are laden atop the soft flavored rice. Had the rice been overdone, it would’ve been mushy and disgusting (who wants regurgitated rice? ), but Calderon’s was cooked perfectly! I must admit, I could easily finish half of that paellera, but I was overwhelmed by all the delicious food in front of me! 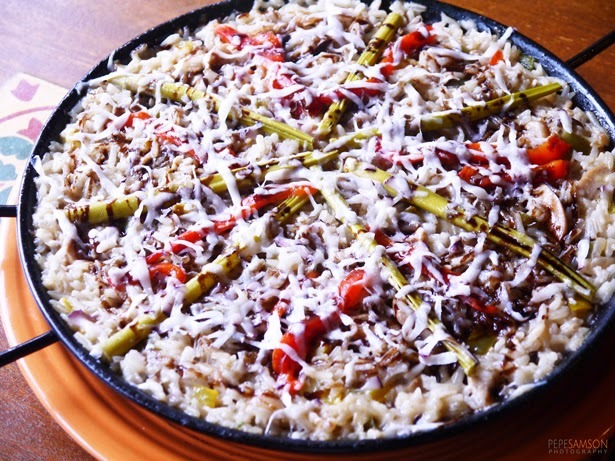 Just when I thought I had tasted the best paella ever, I dug into the other variant: the Paella con Setas, Manchego y Trufa Esencia (P960)—Paella with Mushrooms, Manchego and Truffle Essence. WAIT, DID YOU SAY TRUFFLE?!?! Being the truffle junkie that I am, this paella truly intoxicated me. I wanted to sniff the pan forever—maybe even bury my face into it. The simple combination of mushrooms and manchego cheese with truffle-infused rice was insanely delicious! Adios, truffle risotto! I wanted to keep on stuffing my mouth with the truffle paella but there were two other dishes I haven’t tried yet. 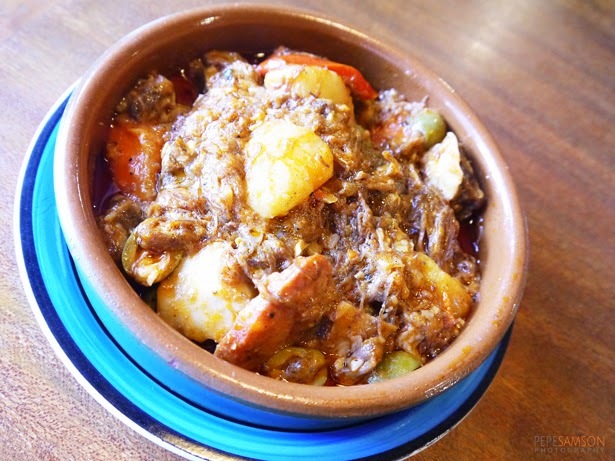 The Beef Caldereta is a new item in Calderon’s menu. Their rendition is very similar to the caldereta we have at home—tender beef, chorizo, bell peppers, potatoes, carrots and olives compose this dish, thickened by what I supposed was liver. Not as spicy as I would’ve liked, but definitely one of the best—and authentic—versions I’ve had. Compared to other Filipino versions which are too tomato-ey, this one was perfectly balanced. Calderon’s Lamb Adobo, another new dish, played a bit with the Pinoy classic by substituting pork with lamb. The switch was barely noticeable, as the lamb was perfectly tender (and fattier), and without the off-putting smell. This one was just as addicting as the caldereta. Of course, we didn’t leave without trying Calderon’s Sangria. They have two variants—the red and the white: the former sweeter, and the latter seemingly more “potent”. 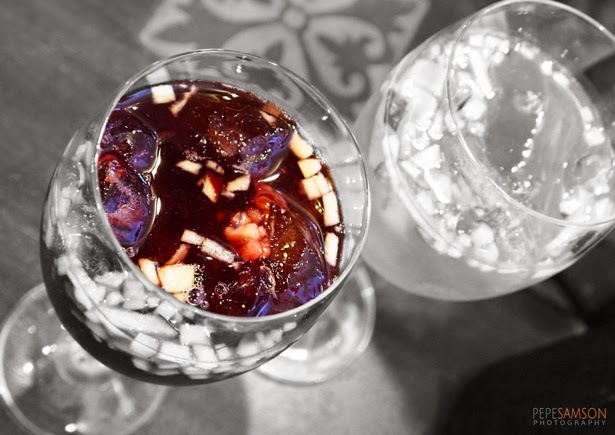 I enjoyed sipping these sangrias while indulging in all the delicious food—in fact, I drank too much that I was feeling a bit dazed all day at the office, LOL. while listening to live jazz or acoustic music! 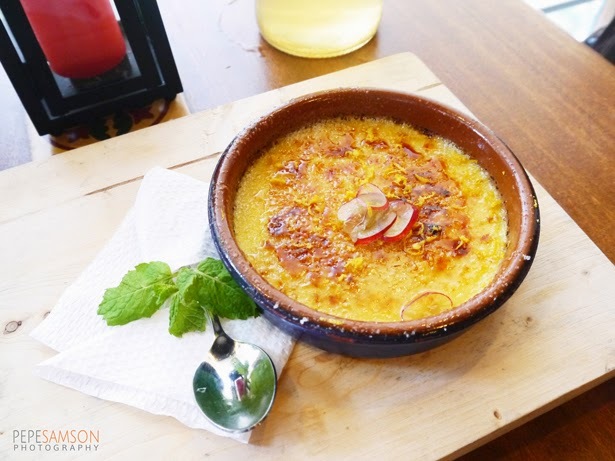 Calderon is also introducing a new dessert: the Crema Catalana—or crème brulee. The melt-in-the-mouth custard base is topped with hardened caramel, which breaks into delightful, ice-like bits when put inside the mouth. I absolutely enjoyed eating this one! Dining at Calderon is like eating at a home away from home. 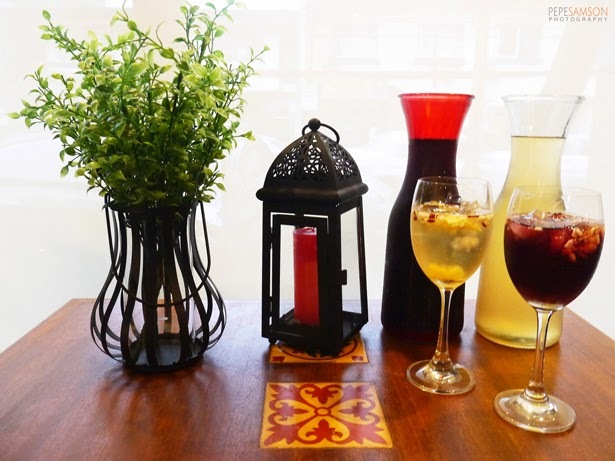 With its friendly and laidback ambience, it’s an enticing venue for a lazy family lunch or a sangria-fueled dinner with friends. The place is small but the flavors are big—the food casual but not haphazardly made. A place ideal for sharing not just food but stories—which is exactly what we did during this 4-hour lunch. A place I would definitely revisit with family and friends. I can’t wait to get back to try the Paella Negra and the Pollo Iberico and indulge in more truffle paella, caldereta and sangria. Thanks to PinasMuna for dragging me over to this exquisite lunch and to the owners Marmi Perez, Angela Melo and Monchet Carballo, as well as Chef Rafa Ysip for accomodating us! What's your favorite Spanish food? 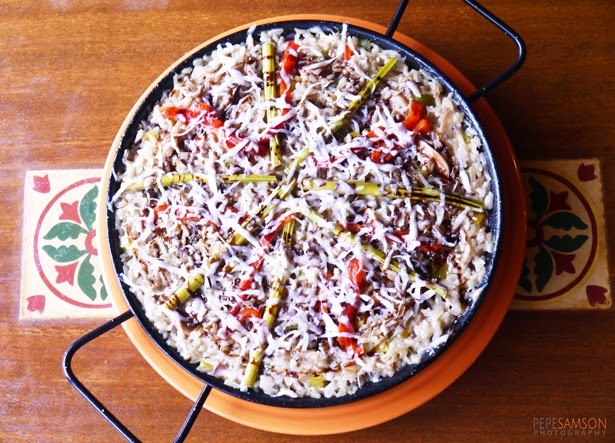 Where's your go-to Spanish place? My meal was sponsored by Calderon. All opinions, however, are my own. Paella is probably the only Spanish dish I have tried. Your photos are inviting! I would love to try Lengua con Setas! Hi Kat! 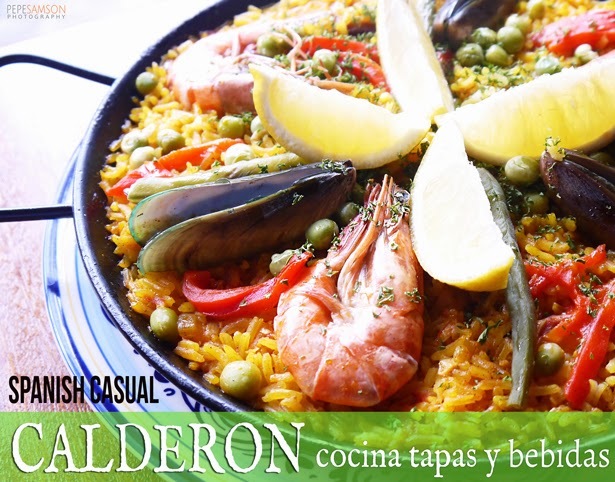 Calderon's paellas are so good, try them! And yes try the Lengua. Let me know how you find it. Thanks for dropping by and leaving a comment! The Perfect Pint: Cheers for the Hoppy Times!